Where in the world is Reily, O'Leprechan?3/9/2011Attacked... Taken away... Send help... beware Viper.. These words were scrawled on the Scrap of evidence that a wandering adventurer discovered and turned in several days ago. The "Bureau" has placed Agent York in charge of discovering who is in danger. Currently Agent York is investigating in Payon, your help is requested by the Bureau to provide the muscle of this investigation. If you choose to take on this mission please note that you will be in dangerous territory investigating for more Scraps of Evidence to pin down the location and nature of this incident. Only adventurers level 60 or higher should apply for recruitment to cut down on resurrection costs. The areas you will be investigating is overrun by agents of V.I.P.E.R., please use this map to focus your investigation once you have been recruited. A box containing 1 St Patrick's Hat. 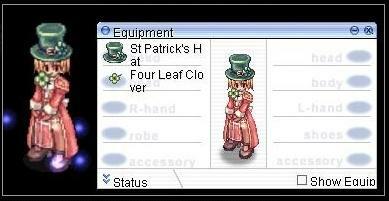 Available March 10 - 31st This hat can also be obtained once per character by participating in the St. Patrick's Day event by speaking to the Mysterious Man in Payon for free by doing the quest. If you want to skip the quest or obtain more of these Hats then the Kafra gals have you covered. This Box is tradable, the Hat inside is not. This item is not available for refund or cancellation of purchase once opened. This is an exact replica of the hat worn by O'Riley the Leprechaun. Str +1, Int +1, Mdef +4. 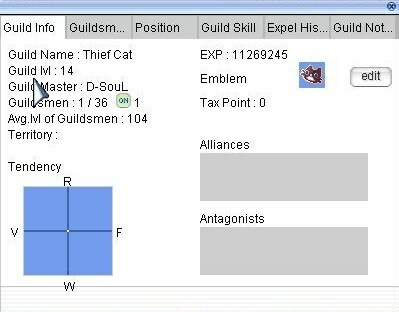 If refined to +7 or higher, adds a chance of dropping Green Ales with every monster killed. Available March 10 - 31st This item is not available for refund or cancellation of purchase once opened. - Special Turnin events enhanced with the Baby Dragon Hat! So you like to party! We like to party, so lets get in-game and gets some levels and make some new friends at the same time! From March 3 - 17, we will have 4 special Repeatable Turn-in events, chosen by you the community! We had a WoE event on Saturday where the winner gets to choose a Turn-in event, and we would make it happen. 1.Animosity on Ymir Chose to have a Vanberk/Isilla hunt in Rachel 1. 2.ObserverS of Yggdrasil wanted Gold Acidus in Abyss 3. 3.Valkyrie Guild on Valkyrie chose Removers in Biolabs level 1. All the monsters that are targets for this quest have their exp/jobexp set to 0 for the duration of the event, however that means that each take parties become the call of the day! The turnins will give about 70% of what the normal kill would be for that monster. This can be enhanced! We are selling the Baby Dragon Hat again, and it will offer +30% bonus to the exp amount for ALL of these turnins, as well as the option to focus all the exp into base or Job. Plus we are hiring a guide to sit in the Eden group to warp qualified level adventurers with the Baby Dragon Hat to the event map! And the HE Battle Manuals are also available which will double the turnin value! Bring friends because the monsters have stepped up their breeding programs to meet the army of adventurers they know are coming! - Convert 4000+ WP in one transaction -> Kafra Points and earn a Free "Dark Snake Lord Hat"